With my son running in the Stanford XC Invitational on Saturday, I took the opportunity to spend a few hours tagging a few minor summits in the area. Most were in San Mateo County around San Carlos and Redwood City, none of them terribly exciting, but not without some interest. This unnamed summit was the most interesting of the bunch, located in the pricier hills of Redwood City near the border with Woodside. There is a small park located on the SE side of the summit called Easter Bowl. It comprises an undeveloped hillside covered in oak woodlands whose primary users appear to be BMX riders. The upper slopes of the park are a collection of steep jumps that look exceedingly fun and at the same time, downright dangerous. Surprisingly, there is only a modest amount of grafitti and trash found in the park. Above the park is the summit of Peak 940ft, crowned by a water tower, a large white cross and a smattering of cell towers. I found the juxtaposition of religion and technology humorous. The views to the south and southwest take in the Santa Cruz Mtns while to the east and northeast is the urban sprawl of the South Bay. A variety of fences and No Trespassing signs surround the complex, but it is a simple matter to walk up to the top which many evidently do. One can park off the road next to the water tank for an even shorter visit, bypassing Easter Bowl completely. To the north lies the small summit of Eagle Hill nearer to downtown Redwood City. Though Eagle Hill has been nearly completely developed, the Hetch Hetchy Aqueduct runs right over the summit on its way to Upper Cyrstal Springs Reservoir. This can be seen as a strip of undeveloped land running across the landscape. An easily breeched fence with a large gap at the bottom can be used to hike a short distance to the top of Eagle Hill (the very highpoint is located about 5ft higher in someone's backyard which I didn't visit - even I have my trespassing limits). Poor views. This unnamed summit lies just outside the southern boundary of San Carlos in the hills overlooking Upper Crystal Springs Reservoir and Interstate 280. Like the easement on Eagle Hill, the property here is owned by the SF Water Dept, but policing is sparse. The highpoint is found just inside a fence up against the road. About 1/3mi away is a slightly lower point that was once a View Area that could be reached from the freeway. It has been closed for a number of years, a result of budget cuts, but it's hard to understand why it was ever built in the first place. I hiked the short distance to check it out, nature doing her best to reclaim the land through cracks in the asphalt. Grafitti and and trash suggest it still gets some use by neighborhood youths. A buck with one antler took off from under a tree in the center where it had been resting. One side of the view area has been fenced to house a number of cell towers. The view is decent looking southwest to the reservoir and the Santa Cruz Mtns. Belmont Hill lies mostly in San Carlos, with a small portion in the city of Belmont named after the hill. This moderately-sized hill has been completely developed. A heavily fortified fence bars access to a pair of old water towers placed at the summit many years ago. 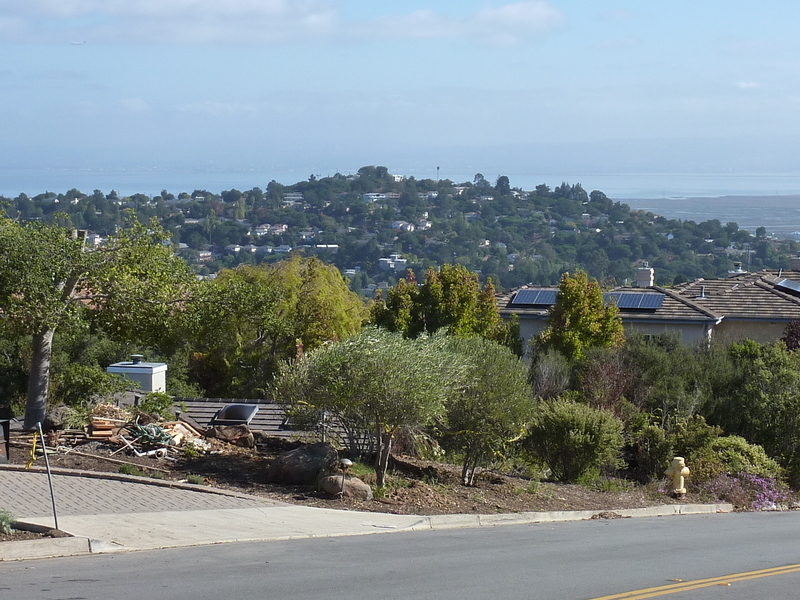 A driveway serving two homes and the construction of two new water towers is found on the north side of the hill and provided a fortuitous access point to the summit. I half-expected someone to ask me what I was doing in there, but no one came out to disturb my inspection of the new facilities under construction. I found the highpoint tucked into the NE corner of the water tower area. No views. This was the most disappointing summit of the morning - this tiny hill is completely developed and has no easement or water towers to help out. The best one can do without serious trespassing is drive around the top group of homes and try to guess which one occupies the highpoint. After spending almost three hours watching cross-country races at the Stanford golf course, I paid a visit to one more hill before heading home. It was not clear who owns this small hill SE of Stanford University in Palo Alto, but it's signed for private property and No Trespassing. There are a number of high tech companies headquartered at its base including VMware and SAP. I could find no legal street parking, so I parked in the near-empty lot of PARC, the Palo Alto Research Center, originally an R&D branch of the Massachusetts-based Xerox corporation. PARC innovated a number of key technologies including laser printers, the PC mouse, the Graphical User Interface (GUI), bitmap graphics, Ethernet, and more. While Xerox regrettably neglected much of what was developed at PARC, Apple famously ripped off these impressive breakthroughs to put in their own hugely popular iMac. Luckily PARC is not heavy on security personnel and no one came to inquire about the suspicious van parked in their lot. After crossing the road, I found a hole cut in the barbed-wire fence surrounding Coyote Hill, climbed through, and made my way to the summit in less than 5 minutes. The hill has been heavily overgrazed by horses, leaving mostly just bare dirt and much horse manure. Some old oaks are concentrated on the crest of the hill leading to the open, bare highpoint. There are decent views to be had from the summit of the surrounding peninsula landscape including the Stanford Campus to the northwest. Bob, boy you really pushed the envelope today trying to find "any high point" to describe, you certainly have motivation :) I was at the meet with my son too. Dear Bob. how about finishing the 2014 sierra challenge real mountain write ups before telling us about climbing "hills".